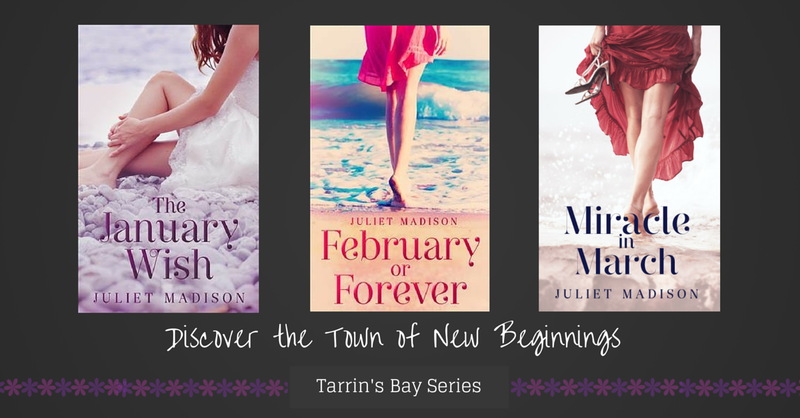 Today I’m sharing an interview I did about my Tarrin’s Bay series, in which I discuss writing about difficult topics, whether my characters are based on real people, and why Tarrin’s Bay is such a magical place for people to start a new beginning. You can also read Suze’s review of my latest Tarrin’s Bay novel MIRACLE IN MARCH, here’s a snippet… “I think the way Juliet Madison describes Jackson’s autism is really beautiful. The same can be said about how she handles other difficult topics in the story. She writes about them with such care and compassion and the feelings she describes are spot-on.” Read more HERE. THE JANUARY WISH* ~ a sweet, emotional contemporary romance about the pleasures of making a wish and seeing it come true. FEBRUARY OR FOREVER ~ What if your favourite celebrity fell in love with you? MIRACLE IN MARCH ~ She took a break from real life, and found what she didn’t know she was looking for. *The January Wish is also available in paperback as part of the 3-in-1 anthology TIME FOR THE BEACH. Posted on June 25, 2015, in Books, General and tagged author interview, escape publishing, february or forever, miracle in march, Tarrins' Bay Series, the january wish, time for the beach. Bookmark the permalink. Leave a comment.